Clearly visible from space, the Grand Canyon's magnificent breadth, depth and overall extent are awe inspiring. Rapidly changing weather conditions frequently create a moving theatrical drama that no cinematic panorama can replicate. Storms can be raging in one part of the canyon while elsewhere basks in bright sunlight. There are people who return many times and are rarely disappointed as the light and colours of the rocks regularly change from dawn to dusk, season to season. The Canyon's famous diurnal drama draws acolytes from all over the world to take part in the quasi-religious ritual of gathering at dawn to witness the curtain of darkness fall away into the depths of the gorge. The rising sunlight from the east flashes across the landscape, illuminating the younger, upper layers of strata first. Then gradually as the light brightens and intensifies, the sunlight penetrates the deeper and geologically older recesses of the gorge until there is virtually no shadow left anywhere. In the late afternoon the procedure is reversed as darkness seems to rise from the Canyon's abyss. As the sun sets in the west, the uppermost strata go through an amazing sequence of colour changes as the sunlight reddens and darkens. Thomas Moran, 1837-1926, English-born painter whose weaver parents emigrated to America, became an engraver with his brothers. Joined Hayden's 1871 Yellowstone expedition. His painting of the Grand Canyon of Yellowstone was the first American landscape bought by the government (for $10,000) and helped President Grant secure the protection of the region. 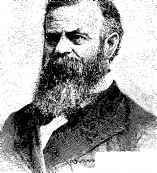 Major John Wesley Powell, 1834-1902, self-taught naturalist and one-armed veteran of the American Civil War (1860-5), professor of geology at the Wesleyan University in Bloomington (1865), who led the first scientific expedition to travel the length of the Grand Canyon (1869, and again in 1871) and became the second director of the US Geological Survey (1881). joined John Wesley Powell's second expedition to the Canyon. Moran's magnificent and enormous, 2 m by 3.5 m canvas was unveiled in 1872 in Boston and attracted huge crowds who had never before seen anything like the grandeur of the Canyon's landscape. Church paints a mountain like a kingdom of glory. Bierstadt paints a mountain cliff where an eagle is lost from sight ere he reaches the summit. Thomas Moran marries these great characteristics, and in his infinite masses cliffs of immeasurable height are seen. Today, it is hard for us to imagine the impact that Moran's picture had. The scene that is so familiar today from photographs and that we take for granted was then almost unbelievable, beyond imagination and wildest dreams. Moran did not have to exaggerate what he saw and was careful to paint what was actually there in front of him - a gaping chasm broken open to reveal layer upon layer of rock descending into the abyss, all depicted in such realistic detail that it had to be true. Powell himself remarked that the canyons of this region of North America were like ca Book of Revelations in the rock-leaved Bible of geology'. Albert Bierstadt, 1830-1902, German-born painter who emigrated with his family to America, revisited Germany (1853-8) to train as an artist before returning to America and joining Colonel Lander's 1858 Rocky Mountain railway survey as artist. His resulting spectacular landscapes sold well in New York. And yet, the evident vastness of such natural features and the depth of the Canyon were influential in convincing many people that it must have taken an equally vast immensity of time for such a thickness of strata to have been laid down. And then how much more time was needed to be uplifted and so dramatically dissected by the Colorado River for all to gape into the abyss of time? How could all this have been achieved in a mere 6000 years? Although it is now one of the most visited natural wonders of the world, the Grand Canyon was ignored for three centuries by the Europeans who first explored the western interior of North America. Native Americans knew about the Canyon several thousand years ago and indeed some of them even lived within it. We now know that humans have occupied the Canyon for at least 4000 years, with over 2600 documented prehistoric ruins, including evidence of what are called Palaeo Judiou and Archaic cultures by archaeologists. The most recent native peoples to inhabit the region were the Anasazi on both the South and North Rims and the Inner Canyon, while the Cohonina were restricted to the South Rim. The Canyon appears to have been abandoned by native Americans, sometime after 1200 AD, perhaps in response to climate change, and then reoccupied some 100 years later when the Hualipai and Havasupai Indians moved into the region. These people remained undisturbed by outside forces until the Anglo-Americans arrived in the 1860s. The archaeological evidence tells a story of how these human societies adapted to severe climate change and physiographic variation. The Canyon's topographical and climate range produces environmental changes that extend over five vegetation zones and five of the seven life zones defined for the whole of North America by Dr C. Hart Merriam in the late nineteenth century. As far as we know, the first Europeans to see the Grand Canyon with their own eyes were a small party of 13 Spaniards. In their greedy search for the fabled Eldorado - cities of gold - they were prepared to risk life and limb and go almost anywhere. In 1540, Hopi Indian guides led Captain Don Garcia López de Cárdenas to the South Rim of the eastern part of the Canyon, but they could not find a way down the gorge to the Colorado River. Although the Spaniards were impressed by the sight of the Canyon and reported what they had seen, it was another two centuries before more Europeans were to visit it. Inevitably perhaps in the aftermath of the Spanish invasion it was two indefatigable missionary priests, Father Silvestre Véez de Escalante and Father Francisco Domíngues, out to save 'savage' souls, who in 1776 discovered a ford across the Colorado. Even then, it was the best part of another hundred years before there was any further interest in this remarkable natural phenomenon. First on the scene in the 1830s was James 'Ohio' Pattie, who even published a description of this remarkable phenomenon, but there still was no rush to admire the view. The main stumbling block was the problem of access, but eastern entrepreneurs were soon trying to fix that by extending the railroads across the continent. The problem was what route to take. Jules Marcou, 1824-98, Paris-educated Swiss geologist who worked on the geology of the Jura. With Thurmann visited America (1847-50), where he met Agassiz. 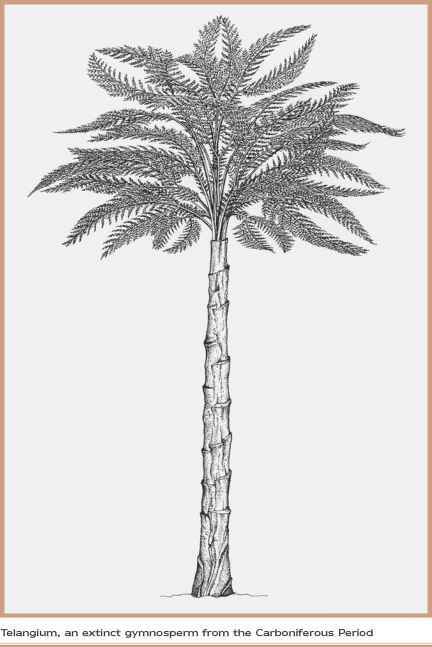 Published one of the first geological maps of America (1853), professor of geology in Zurich (1855-9), returned to America (1861) to work with Agassiz in the Harvard Museum of Comparative Zoology and published a geological map of the world (1861). John Strong Newberry, 1822-1902, American physician and geologist, practised medicine (1851-5), appointed surgeon and geologist to the Williamson (1855-6), Ives (1857-8) and Macomb (1858) expeditions, army medical sanitary inspector during the Civil War. 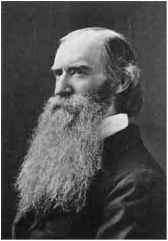 Professor of geology at Columbia School of Mines (from 1866), Ohio state geologist (from 1869), palaeontologist to the USGS (from 1884), Murchison medal of the Geological Society of London (1888). Ours has been the first, and will doubtless be the last, party of whites to visit this profitless locality. It seems intended by nature that the Colorado River, along the greater portion of its lonely and majestic way, shall be forever unvisited and undisturbed! A decade later John Wesley Powell led a party of 10 on one of the great pioneering journeys of the continent. They voyaged for 1000 miles down the Colorado River through the Canyon from Green River, Wyoming to the mouth of the Virgin River, at what is today the north end of Lake Mead. Their frail wooden boats were at times battered, overturned and smashed against the rocks by violent currents, rapids and whirlpools. The team was reduced to nine and then six by the perils of the journey, but Powell's monumental 1876 report changed everything. 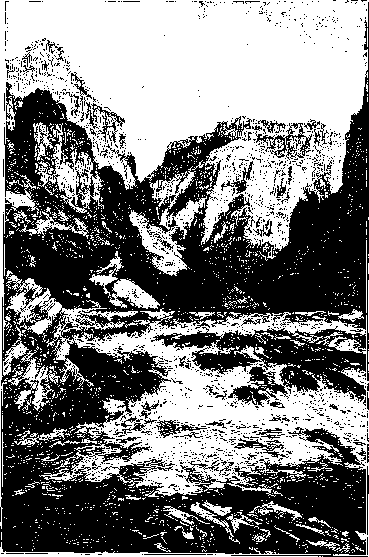 With its numerous illustrations, it became possible at last to get some idea of the nature of the phenomenon, its grand scale and the unique strangeness of the Canyon's landscapes. The inner gorge of the Colorado with the steeply inclined Precambrian metamorphic rocks forming dangerous rapids in the foreground. Tourists started visiting the Canyon in the late 1880s and by 1901 it was possible to travel right to the South Rim by train. But how many of the millions of visitors who stare in awe of this great chasm have any real inkling about what they are actually seeing? It takes a great deal of imagination and background knowledge to turn the rocky layers into the real story of the Earth. Lifetimes of toil by countless geologists have been expended investigating these rock layers and trying to understand what they tell us about the history of the Earth and its past inhabitants. The fact that so many visitors come from all over the world just to view the Canyon and that so many of them come back repeatedly suggests that the vista is more than merely a nice view. Perhaps the draw is the unusual combination of the huge panoramic vista of the plateau landscape around the Canyon rim, and then a sense of being inexorably drawn down into the depths and imagined dangers of the chasm. It feels as if the Earth is literally opening up in front of you and many feel a strange pull towards the Canyon's edge. No doubt it is all very symbolic and has the power to take the viewers out of themselves.